We flew in to Heathrow and then on to Edinburgh. Our luggage did not. It took the British Airways baggage claim people an hour to let us know that, due to a scanner failure at Heathrow, there were somewhere around five hundred pieces of checked baggage that were essentially missing. It took another hour to get our information sorted out with baggage claims. We were told that it would be more than twenty-four hours for the bags to be delivered to us, so I gave them the address where Marsha and I would be staying on the second night of our two-week journey through Scotland. What followed was six more days of exceedingly frustrating calls to the baggage claim call center somewhere in India that lasted on average two hours each. Two hours each morning of being on hold, only to be informed that the whereabouts of our luggage was not known, and that there was no way for them to get in touch with us if they did locate them, for they could neither call out nor send emails. I found it both very frustrating and very telling that the customer service numbers for both British Airways and the courier company were taken out of service. It was not until I pulled the medications in the bags card, which was absolutely true, that I received a call from a very nice man at the Edinburgh Airport baggage claim who immediately had our luggage flown to our next stopping point: Tarbert on the Isle of Harris. During those six days, we not only spent hours on the phone, we also spent a lot more time than we would ever care to shopping for something to wear in the meantime. I am choosing to look at these experiences as more time to chat it up with Scots who are not in the tourist/ food service industry. We met some very nice people. The Primark store in Greenock wins the prize for helping us sort out the UK vs US sizes, and the M & Company in Kirkwall wins the patience prize as the two sales women stayed a few minutes past closing to accommodate us. I am also choosing to look at the experience overall as a lesson in the fact that I really can wear the same pair of jeans for five days, rotate the wearing of three shirts, and yes, even wear the same bra for six days (with one washing out of it). Tesco was our go-to for new socks and underwear. Marsha and I had just about gotten our heads around the lost luggage fiasco, when the next one came with a literal bang. We were on the A835 just south of Strathcanaird (Srath Chainneart), heading in to Ullapool (Ulapul) when a truck (lorrie) came fast at us up a hill and took up more than its fair share of the extremely narrow road. As I drove through the next minute or so, I saw it all come before me in the proverbial slow-motion of a catastrophe. As I saw that the lorrie was not going to move over to the right, I scanned the left edge of the road. There’s never any shoulder on these winding roads, and so I expected that I would be off the asphalt and into the dirt. What I didn’t expect was that the road would choose that particular place to have fallen away at the edge, leaving a gaping hole that dropped a good eight to ten inches to the ground. I knew that the front left tire was headed for that hole as if a magnet were drawing it there and I had no time to correct the situation. My first thought was that the car might flip, but instead it hit the hole with the resounding pop of the tire exploding upon impact. 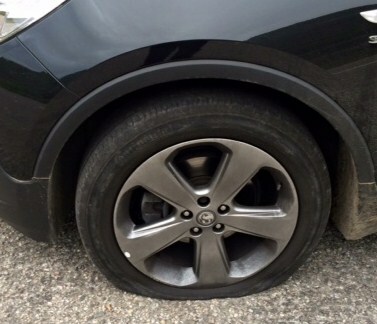 I have never had a tire blow while I was driving, and I have often wondered how I would handle the situation. Would I remember everything that my dad taught me about emergency driving if an emergency actually presented itself? I now have that answer to the question. If I do say so myself, both the car (a Vauxhall Mokka) and I performed beautifully. There was not a bit of swerving or loss of control, and I was able to bring the car to a stop in only a few yards. Fortunately, there was a pull out located directly across the road from where I stopped the car. (As I write this, I wonder why the lorrie driver couldn’t have managed to use the pull out for more room instead of taking it from my side of the road.) I got the car over to the pull out without having the tire come off the wheel and then I did the next most practical thing I could think of. I calmly got out of the car, closed the door, looked at the tire, and then let the loudest f-bomb I could muster reverberate off the hills of the Highlands. And then, I started to change the tire. This is when I learned that new cars don’t have spare tires. I flagged down a passing car and a woman and her father were extremely gracious in trying to help us set up and use the compressor that was in the trunk (boot) of the car, but the tire was too badly blown. We were able to get enough phone reception to call the emergency number for the car rental company, and soon help was on the way. They would be there in two hours time. We settled in to whiling away the time. As the sun set and the clouds moved over Ben Mor Coigach (Beinn Mhòr na Còigich; 2438 ft/743m), Marsha pulled out her knitting, and I read aloud from Neil Oliver’s book, Vikings, which I had purchased for Liisa. This was the time when I received the phone call from the sensible and very helpful chap at British Airways who flew our luggage over to Harris. It’s very interesting that up until that evening, I had not been able to get phone reception anywhere I had tried it. After that, it worked like a charm for the duration of the trip. At 9:00 PM, our rescuer, Robert, safely strapped the Vauxhall to the flatbed and we were off on the hour’s drive over to Dingwall where we could get the tire fixed. I’m sure there was a place in Ullapool that could do the job, but rental companies and insurance companies being what they are, Dingwall was our only choice. Robert kindly stopped in Ullapool so that we could get a warm drink, and as the three of us rode along in the cab of his lorrie, we learned that the reason it took him so long to get there was that he had driven from Tain, which is north of Inverness. We talked about many things: his job as a lorrie driver between Scotland and Brittany; the vote for Scottish independence; his parents’ jobs as tour guides in the U.S. for UK nationals; and where our trip was taking us. We were only half an hour or so in Dingwall (Scots: Dingwal; Gàidhlig: Inbhir Pheofharain) while the tire was replaced, and then we were on our way back to Lochbroom (Loch Bhraoin), just a few miles south of Ullapool. I had been in touch with our hostess, Marie, at the B&B, and she left the door unlocked and the lights on for us. At 11:30 PM, we quietly came in to the house to find a bowl of fruit and yogurt waiting for us so that we didn’t go to bed hungry. We crept in to our respective rooms and, I don’t know about Marsha, but I was asleep in minutes. The Clachan Farmhouse is located in a serene glen with rolling green fields. Clachan refers to a small village or settlement, and the farmhouse is located quite near a little church. A working farm, Clachan has North Country Cheviot sheep, Luing cattle, and champion Border Collies that, sadly, we did not get to meet. Marie welcomed us in the morning with a hearty breakfast and a hot pot of tea. We were disappointed to not have been able to enjoy the fire she’d had waiting for us in the drawing-room the previous evening, but were consoled by the her admission that we wouldn’t have been able to see the sunset from there as we had from the roadside. In good time, we were off to Ullapool and the ferry that took us to Stornoway, Isle of Lewis from which we drove to Tarbert, Isle of Harris and our luggage. This entry was posted in Ancestry, Eco-travel, Ecology, Land trust, Scotland, Scottish ancestry, Travel and tagged Clachan Farmhouse, travel. Bookmark the permalink.